For The Estée Lauder Companies, fiscal 2009 was a year of change and opportunity. Although the difficult global economic conditions impacted our financial results, our employees showed tremendous resourcefulness during this challenging time and I am extremely appreciative of their dedication, hard work, flexibility and skill. The worldwide recession impacted sales in all regions and brands to varying degrees, which is reflected in our lower sales and earnings. Retail sales of consumer goods, including beauty products, fell sharply, due to the decline in consumer spending. In the face of these external forces, we took many defensive steps that made us stronger, smarter and better able to tackle competitive challenges that may come our way. To protect our earnings we moved quickly to cut costs, reducing planned spending by $250 million. By doing so, we remained profitable, enjoyed a healthy balance sheet and generated strong cash flow from operations. We announced salary and hiring freezes and the unfortunate, but necessary, decision to reduce our workforce by six percent over the next two years. Operationally, we achieved solid progress in a number of key areas, leading to greater efficiencies and integration. We finished the year with major improvements in inventory days and sharply cut the number of stock keeping units (SKUs) that we carry. We focused on better aligning our supply chain with the brands and regions, which should enable us to achieve greater cost and time efficiencies. We modernized our processes and technologies in some demand planning and financial functions and at our U.K. manufacturing operations. While we adjusted our plans to deal with the unexpected economic downturn, Fabrizio Freda and I, along with our senior leadership team, were also busy developing the Company's four-year strategy that sets out new goals. I am proud of how our employees came together in support of the new strategy and pleased that, overall, investors responded favorably. Companies that succeed in tough times like these, and emerge even stronger, share common traits. They are diversified in their geographic scope, distribution channels and product offerings and have a strong financial foundation and clear path for future growth. We possess all these attributes, and many more, including decades of brand-building and commercial expertise, a portfolio of world-class brands and a long history of superior creativity, innovation and High-Touch personal service. I am also pleased to note that we advanced our long-standing commitment to being a responsible corporate citizen. We have included a special section in this report that highlights some of our activities in philanthropy, social responsibility and environmental awareness. Being actively engaged in the communities where we live and work is a deep-rooted responsibility that is part of our core values and business practices. 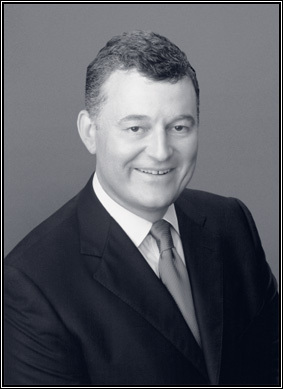 I look forward to continuing to collaborate with Fabrizio, who succeeded me as Chief Executive Officer on July 1, 2009. Together, we will lead the efforts to achieve our objectives for the Company and its stockholders. My father, Leonard Lauder, transitioned to his new role as Chairman Emeritus. I would like to express my gratitude to him on behalf of the whole Company for his vision, business skills, passion and tireless energy. Although he will be less active on a day-to-day basis, we look forward to his continued contributions as a member of the Board and his ongoing role as a valued teacher and advisor. In addition to thanking our employees for their dedication to the Company, I want to extend my appreciation and gratitude to our consumers for their loyalty, our customers who are invested in our brands, our Board for its advice and direction, and our stockholders for their ongoing support of The Estée Lauder Companies. We continuously strive to increase stockholder value and make you proud to be a part of this remarkable Company.